Utah, with a population just under 3.2 million in 2018, the 4th fastest growing state in the nation. Some 30% of the population is under 18, and 11% is 65 or over. It has the some of the world's greatest scenery. That, combined with its outstanding recreational opportunities and healthy economy, attracts a growing number of baby boomers to the many best places to retire in Utah - the Beehive State. Salt Lake City is the capital and 88% of the state's population lives in this Metro along the Wasatch Range. Most of the rest of the state is unsettled. Utah's cost of living can vary a great deal - the Park City area tends to be much more expensive than other parts of the state. Utah was settled by the Mormons. They represent 62% of the population and are a major influence in most areas. Utah has one of the lowest crime rates in the country. The Wikipedia entry for Utah has more interesting facts. Updated April 2019. The Utah climate is that of the steppe, characterized by aridity and an altitude above 3000 feet. Summers are hot and dry, there is plenty of sunshine. There is a lot of dry snow in the mountains. Utah's 2013-17 household income, $65,325, was higher than surrounding states and $7500 higher than the national median. The MERIC cost of living index puts Utah as the 25th lowest cost state in the Union. Tourism and mineral extraction is important to the economy, along with hi-tech. Real estate has been booming in this hot economy. The median Utah home in 2019 had a Zillow home value index of $338,700, well over $100,000 higher than the national Index and 14% higher than the year before. In Salt Lake City the median selling price of a home had increased to $400,800 in early 2019. Homes in the Park City region can easily cost $1 million or more. Tax Burden: At 9.6%, the total tax burden in Utah is about average, 21st highest of U.S. states. Marginal Income Tax Rates. Utah has a 5% flat rate income tax. Retirement Income Exemptions. There is a small retirement credit available to some tax payers. Most pensions are taxable. At age 65 you can get a $7500 deduction for military pensions. Social security exemption. Utah is one of a handful of states that taxes social security income. Sales Tax: State sales tax is 5.95% the average rate after localities add on to that is 6.68%. Property Taxes: Per capita property tax is among the lowest of all states, 37th highest at $945 per capita paid in 2013. Homestead Exemption. There is a homestead exemption for those 66 and older who make less than $30,000 a year. Veterans might be able to get a sizabel exemption. Estate and/or Inheritance Taxes. Utah has no estate or inheritance tax. Utah does not have a certified retirement community program. Utah has only recently begun attracting retirees, mostly in the St. George and Park City areas, both of which tend to be more religiously diverse than Salt Lake City and other parts of the state. St. George, located in extreme southern Utah, is the fastest growing community in the U.S and has many planned retirement communities. It is only 30 miles from Zion National Park. Park City, which was home to the 2002 Winter Olympics along with Salt Lake City and other communities, is a booming and wealthy 4 season resort based on an old and charming mining town. 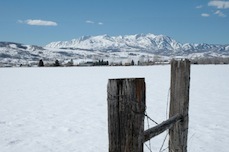 Utah's powder snow is legendary and attracts skiers from around the world to the many resorts in its Wasatch Mountains. Ogden is also near Salt Lake City and offers outstanding outdoor recreation. Its nearby ski resorts were home to some events in the 2002 Winter Olympics. Cedar City, the "Festival City", is a lower cost town for retirement, also in southern Utah. Cedar City has an altitude of 5800 feet and has great skiing nearby. Here is more inside information on retirement living communities in the neighboring states to help you retire in Idaho, New Mexico, Texas, Arizona, California, and Colorado. These links provide insight and data into economic conditions, climate, top communities, and taxes. Get started with the Utah retirement town reviews on the right.